The Santa Fe College Teaching Zoo eagerly welcomed a newborn baby lemur on Tuesday, April 24. 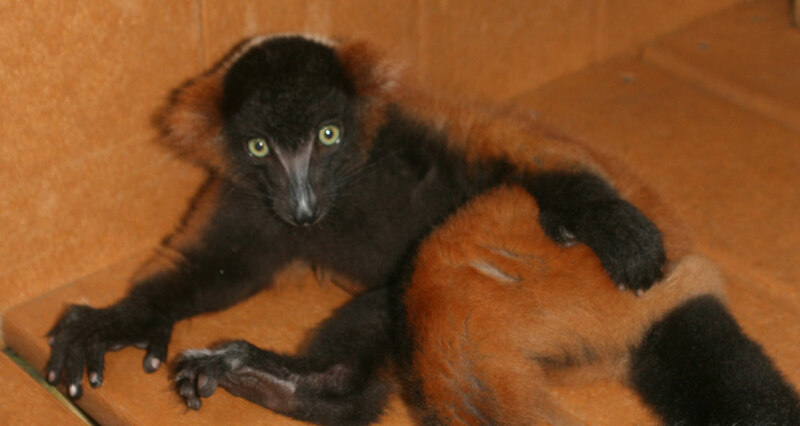 The baby Red Ruffed Lemur was born to parents Moilie and Hedy. Moilie is a nine-year-old male lemur from San Diego Zoo and Hedy is an eleven-year-old female lemur from the Duke Lemur Center in North Carolina. This baby lemur is the first successful Red Ruffed birth at the SF Zoo! Lemurs are endangered mammals that only live on the small island of Madagascar. They are lively, tree-dwelling primates with cat-like noses and whiskers. They’ve got soft, reddish brown fur covering their small bodies. A healthy adult lemur is only expected to weigh 8-10 pounds. Regardless of their size, these mammals are quite social. Most lemur communities number 2-5 individuals. Lemurs rely on their sense of smell as a method of communicating with other animals. They have exceptional scent glands on their wrists and bottoms that leave scent trails on twigs and branches to mark their terrains. Lemurs are predominantly vegetarians, eating things such as flowers, fruits, seeds, nectar, and leaves. Their natural habitats are tropical rainforests, where they’ve got plenty of tall trees to swing around on. The lemur’s thick bushy tail serves as a balancing tool when it leaps through the trees or as a visual signal when it feels threatened. A lemur’s lax, broad fingers and toes have smooth nails that allow it to grab objects and groom other lemurs. If you’re interested in meeting Santa Fe College Teaching Zoo’s newest addition, stop by for a visit. Zoo hours are 9 a.m. – 2 p.m. daily. Admission is $5 for Adults, $4 for Children ages 4-12 and seniors age 60 and up. Admission is free for children age 3 and under and SF students, faculty and staff with ID.